Originally known as Buckingham House, the building which forms the core of today’s palace was a large townhouse built for the Duke of Buckingham in 1705 on a site which had been in private ownership for at least 150 years. It was acquired by George III in 1761 as a private residence for Queen Charlotte, and known as “The Queen’s House”. During the 19th century it was enlarged, principally by architects John Nash and Edward Blore, forming three wings around a central courtyard. Buckingham Palace finally became the official royal palace of the British monarch on the accession of Queen Victoria in 1837. The last major structural additions were made in the late 19th and early 20th centuries, including the East front, which contains the well-known balcony on which the royal family traditionally congregates to greet crowds outside. However, the palace chapel was destroyed by a German bomb in World War II; the Queen’s Gallery was built on the site and opened to the public in 1962 to exhibit works of art from the Royal Collection. 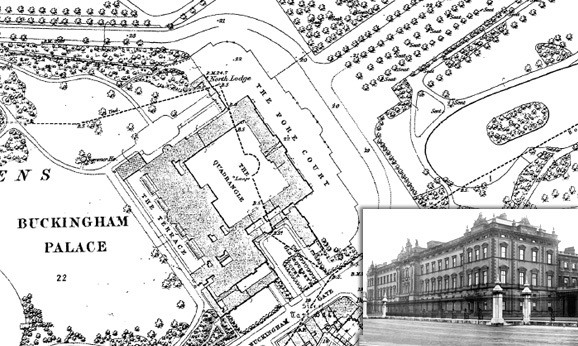 The Palace at the time of the above map had a facade of soft French stone that became blackened over the years due to pollution. The familiar white Portland stone facade of the Palace that we see today wasn’t added until 1913 by Architect Sir Aston Webb. This entry was posted in 1:2500 County Series, History, Local History, Map of the week and tagged 1:2500 County Series, architecture, Bomb Damage, Buckingham House, Buckingham Palace, Duke of Buckingham, Edward Blore, George III, Heritage, historical maps, Local History, Maps London, maps of england, Old Maps, Ordnance Survey County Series, Queen Charlotte, Queen Victoria, royal Household, The Queen by Cassini. Bookmark the permalink.